"The formal text retains the grave and romantic tone of folklore and incorporates free-verse poetry in lyrical songs that echo folkloric rhyme...The design and typography of the poems enhance the emotional cadence and parallel the movement in the underwater scenes." "A delicate balance of prose and poetry that really grabs the reader...Milelli's illustrations reflect the sea and refracted light of the sun on every page. 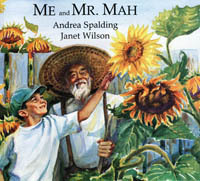 Coupled with Spalding's masterful storytelling, this art proves that picture books can be as deep and moving as any other book." "Evocative illustrations in oil by award-winning Vancouver artist Pascal Milelli provide a moody, watery backdrop throughout the book." "The prose weaves gentle magic, but the illustrations command attention here. Softly hued, earthy, watery, the reader is bound to get lost in each one." "Dramatic oil paintings, particularly effective in their portrayal of the ocean and the selkie, illustrate the bittersweet, evocative story." "Spalding has intertwined traditional Celtic folklore with the west coast fishing way of life to create an enchanting story about a loyal and, ultimately, life-altering friendship. She writes beautifully, with such powerful imagery and a strong sense of place that the text could easily stand on its own...Milelli's vibrant oil paintings transport readers to the natural surroundings of a fishing community. He achieves a dramatic effect by employing blocks of colour, with emphasis on blues and greens, so supporting Spalding by creating the perfect atmosphere for her beautifully crafted text. An inspired pairing! 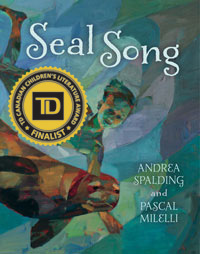 Seal Song will captivate and entrance young imaginations." "Richly illustrated with beautiful, evocative oil paintings, Seal Song is a thought provoking look at what it means to be a friend." "The storm scenes are skilfully rendered, and Milelli's pictures are particularly vivid." "This story will help children understand how kindness and sacrifice can strengthen relationships." "[This] magical story is one of friendship and devotion...The oil illustrations reel you in, as does the free-verse interspersed throughout." "Milelli's illustrations are extraordinary. His unique artistic style, with his colour blocks and vivid palette, harkens back to the works of Paul Cézanne and Pablo Picasso. Milelli's approach allows the reader to bear witness to the natural world with a newfound wonder...Seal Song weaves fishing customs and traditional folklore effortlessly into one tale. Spalding adds depth...by taking a visceral approach to her storytelling. Thus, the reader gains a more intimate perspective into the characters and their experiences. Seal Song beautifully showcases that a friend can take any shape." 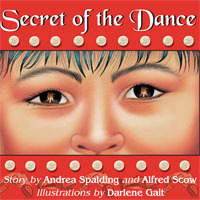 "A strong sense of place, sinewy prose, and an unusual blend of workaday life and fairy tale dreaminess distinguish Spalding's (Secret of the Dance) Pacific Northwest fantasy...The oil paintings by Milelli (The Art Room) are composed, mosaiclike, of planes of saturated color that mimic the play of light across the water and the faces of the fishermen. The sober reality of the tweed caps of the men on the docks and the cannery's wooden buildings anchor the story’s magical elements in a particularly piquant way." "The magical elements of this friendship story seem believable in context, and the bittersweet ending is appropriate...The text is set on or opposite Milelli's dark, expressive oil paintings, which focus mainly on the characters, giving only a rough idea of their surroundings. Read aloud or alone, the storytelling and illustrations work well together, creating a memorable, satisfying whole."